The TracPoint - Rallio Platform is designed to make managing your social media simple and the content you produce impactful. With this innovative program, you can easily manage your social media presence on Facebook, Twitter, LinkedIn, Instagram, Yelp, and Google from one central login. From controlling the content and posts for all your locations, to viewing and responding to all reviews and comments, to monitoring page growth and activities with the reports. It’s all here. Harness the power of social media and protect your brand at the same time. See your best and worst performing locations at a glance and know why they’re performing well or if they need improvement. Post content to all stores, one store, or groups of stores all with a click of a button. Set permissions for each location, to control and manage both content and brand. Our technology platform allows you to create, store, and distribute your social media content, videos, and ads across multiple locations. Deploy specific content to all stores, a group of stores, or a select store quickly and easily. Engage your sales staff to grow your social media presence. The Rallio app lets you engage in the power of local content right from your phone. Manage and post to your social media accounts all from one place. With the mobile app you can quickly and easily create and post content to your Facebook, LinkedIn, Instagram and Twitter accounts. Set permissions and access levels for different members of your organization. Give the ability to create/post content with approval, respond to inbox and respond to reviews. Adjust the settings by locations. Our technology allows businesses to create and post digital offers with unique serialized barcodes for redemption tracking. Attach to any post, drive and measure your results. 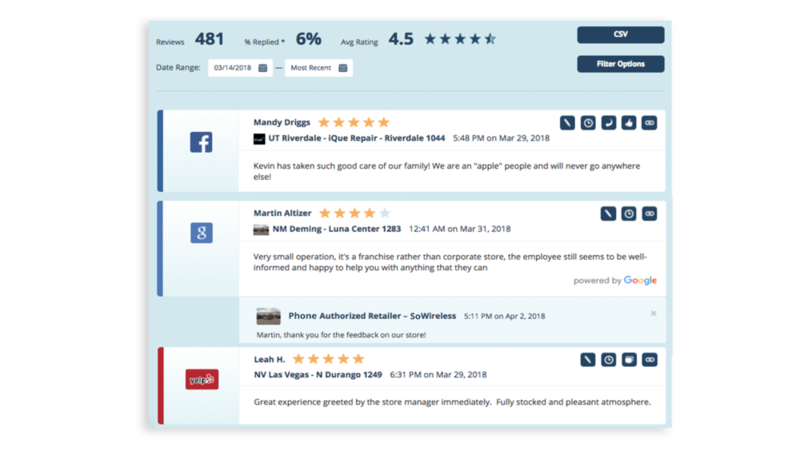 All reviews from your customers are brought into one social reviews tab for you to easily respond to. Check your brand reputation for the company, region, or by individual stores. Even sort by star rating and respond from within the dashboard. You can get alerted via email when someone leaves a negative review. Deploy marketing campaigns around the buying radius of your store within minutes without the need for an agency. Target a store, a region, or all your locations. Posts can be personalized with local store data, along with the ability to link your audience to a serialized coupon and landing page displaying your three closest store locations. Includes advanced analytics to track your ROI. Eliminate inconsistent branding, unclaimed pages, and the chaos of managing your brand across multiple social platforms. Easily update all your social media cover photos and profile pictures with the click of a button. Analytical data at your finger tips for every location. Followers, engagement, check-ins, reviews, brand reputation and more! Plus, TracPoint offers the most robust coupon analytics platform available. Create a coupon and see how it performs.